Toronto Cemetery in Demuin, Somme France is the location of burials from the First World War. Named for the Toronto Regiment (Canadian 3rd Battalion) in August 1918, Canadians who lost their life in service to their country are buried there. To see more information about the Toronto Cemetery check First World War cemeteries and the War Graves Commission Site. Check also the Find a Grave Site. Many in this cemetery died on 8 August 1918. One of those buried in this cemetery is my Great Uncle. To see a companion article go to Janet the Researcher with an article about Harold Edward Iles. See the temporary marker that was placed. These crosses have been replaced with the white stone with the maple leaf. Recently while reading Amy's Genealogy. etc. blog, I learned something I didn't know. She was writing about cenotaphs. Question: When is a tombstone not a tombstone? Answer: When it’s a cenotaph. A cenotaph (literally “empty tomb”) is a memorial for someone who is not buried at that place, either because they are buried someplace else or the body could not be recovered. Sometimes the marker will give you a clue that it is a cenotaph rather than a tombstone. I have always thought that a cenotaph had to be a military memorial. So thanks to Amy, I have have learned something new. I will be on the watch for examples of cenotaphs, not only those that are military memorials to remember a group of people who served their country, when visiting cemeteries. The following would be a cenotaph to a young man who died in the service of his country -- P.O. Donald Ewart Stiver (4th cousin once removed). This cenotaph is found in the Bethesda Lutheran Cemetery (southwest part of lot 17, Concession 6 in the Town of Markham, formerly the Township of Markham, York County, Ontario). Shown above is the east side of the monument. "This fragment is from Tegernsee, Bavaria, where P.O. 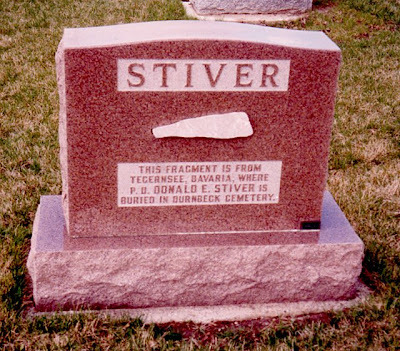 Donald E. Stiver is buried in Durnbeck Cemetery. " The Commonwealth War Graves Commission gives his date of death as 6/9/1943. [ September 6, 1943] He was a pilot with the Royal Canadian Air Force the 44th Squadron. He is buried in a Joint grave 2. J. 20-21. On Donald's death registration, his date of birth was given as July 4, 1923. He was presumed dead from air operations. I believe that he was last seen on September 6, 1943 as in a memorial service for George Coathup at Central United Church [Unionville] reported on July 29, 1944, Don Stiver was remembered in prayer as being missing. His name was also read in the Honour Roll of Bethesda Lutheran Church on August 20, 1944. "P.O Don Stiver, the only casualty on the roll, who was reported missing a year ago, was remembered." See a companion article about cenotaphs at Janet the Researcher.